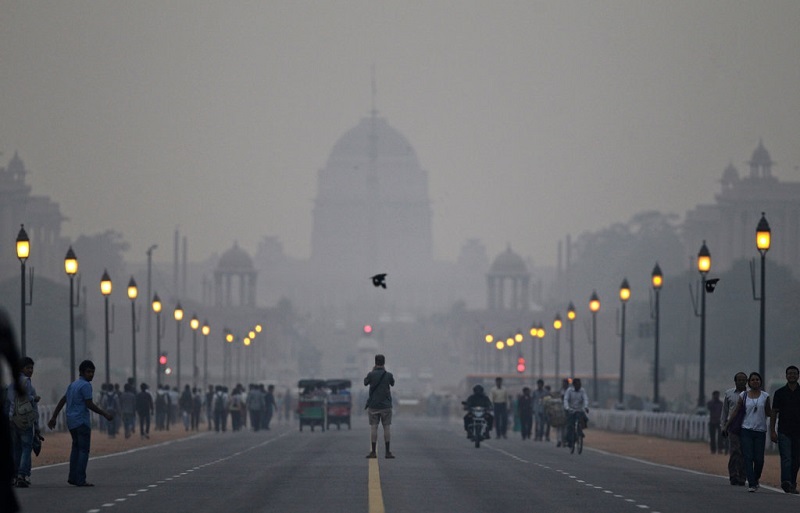 Delhi is facing the problems with pollution emergency every year during winter. Social media feeds are filled with pictures of smog that reduces the visibility to as low as 50 meters and causes significant breathing problems to the citizens. The population and population density of city is comparable to other Indian metros like Mumbai, Kolkata, Bangalore and Chennai. This leads to the question whether Delhi is the most polluting city in India or there are other scientific factors working against it? The answer to this question needs adequate analysis with reference to understanding of pollution, fate of pollution (pollutants), topographical features and meteorology of Delhi and NCR. The air pollution to explain simply is the emission to the atmosphere (air) by natural or man-made processes. For example, emission from operation of Diesel Generator Set, Power Plant Stacks, Fugitive Dust from industries and large construction activities. The fate of this pollution depends upon the characteristic of the ambient atmosphere i.e. 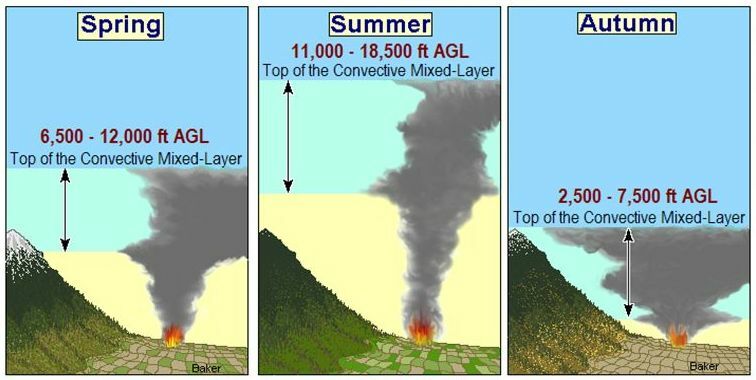 micro-meteorology - vertical temperature profile, wind speed, cloud cover, mixing height, thereby defining the atmosphere as stable to unstable. In an unstable atmosphere, the released pollution will be dispersed in the atmosphere basically by mixing into the ambient atmosphere by virtue of cross-winds and mixing in the surrounding atmosphere by virtue of vertical temperature profile. 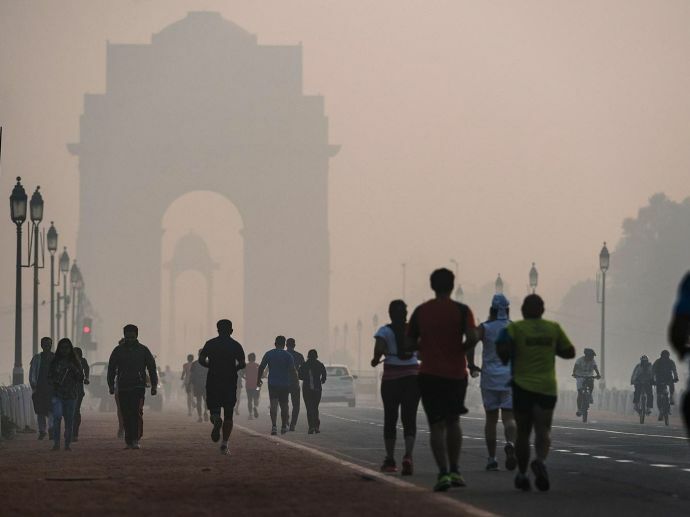 Hypothesis in case of Delhi is that the meteorology of Delhi shows lower ‘mixing height’ which signifies the height above the surface throughout which a pollutant such as smoke can be dispersed. This, along with very low wind speed aggravates the situation in Delhi. Consequently, the emissions released locally are not "dispersed" meaning that it remains in the atmosphere near the ground resulting in maximum health hazards to Delhites. To understand the authenticity of above hypothesis, we will have a glance on meteorology of Delhi and other states of India. 1. The country is basically divided in the southern half and northern half for simplicity also represents coastal and non-coastal states. 2. The wind data and mixing height are referred from Climatology Tables of IMD. It can be observed that there is clear difference between the northern and southern half of the Country with respect to wind speed and mixing height. 1. Delhi need to carry out source apportionment studies (the practice of deriving information about pollution sources and the amount they contribute to ambient air pollution levels) in details and start preparing to fight with this annual recurring problem well before the winter season. The major sources of pollution in urbanized area like Delhi is vehicular density and associated emissions. The industrial emission controls are well established as far as technological advancements are considered, however; emission sources like vehicular transportations shall be focused by implementing low sulfur fuel or at source control by installing absorbents in the exhaust pipes of vehicles (this may need little research base). Also, contained parking area like basements are major sources of pollution in high rise buildings. These basements become similar to furnaces. If industries are enforced to install pollution control devices, these basements are also to be mandated for installation of air purification systems before releasing exhaust from basements by mechanical exhaust system to the ambient air. 2. Categorise the industries separately based on air pollution potential and monitor the highly polluting ones by special monitoring teams. 3. Accept the localized problem of Delhi and act accordingly. You cannot now compare yourself with other states with respect to policies towards industrial development. Delhi and nearby regions shall adopt greener technologies more efficiently. 4. Construction projects shall be closely monitored. Online system of monitoring dust level may be adopted for better control of alarming situations. This is also an alarming situation to other cities like Agra, Gurgaon, state of Haryana etc. with “similar conditions”. If right action is not taken, there are other states in North India who will be affected more than Delhi. 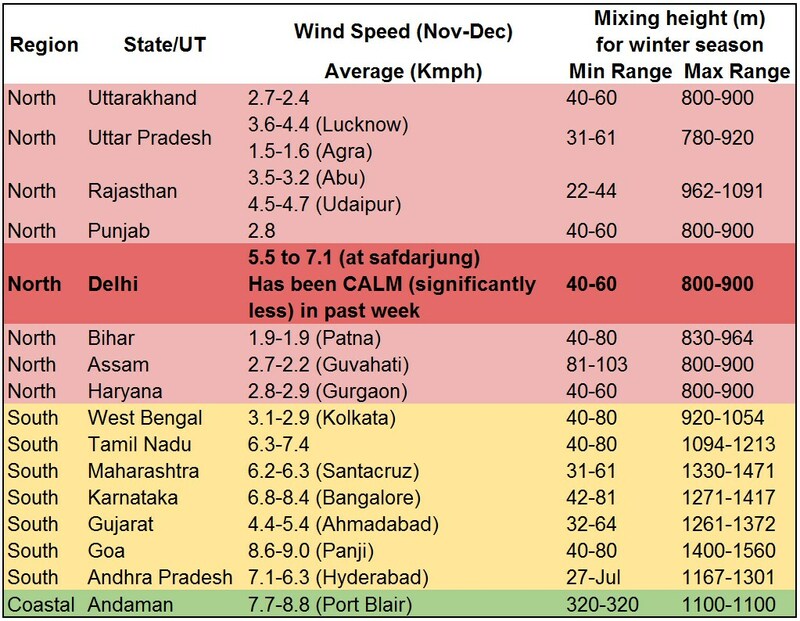 Delhi has reasonably good wind speed than other nearby regions but has lower mixing height. However, in last week the wind was mostly observed as ‘CALM’ meaning low wind speeds in Delhi area. The question that still needs to be analysed in detail is whether the mixing height of Delhi from 40 m to 900m with the low wind speed is the only characteristic leading to suffocation of city? A system must be developed to alarm the citizens when such fatal combination of wind speed and mixing height comes into play. 1. Delhi really needs to think and find out the causes of these pollution episodes. 2. If this is not specific to region, it is hard to believe that only Delhi is on the fast track of development with respect to industrial set-up and boom of construction projects. Mumbai should have the sensitised lungs than of Delhi if it is a matter of construction industries and states like Odisha and Jharkhand will be the first for damages due to industrial pollution. 3. Or it is just because Delhi is in news and other cities have yet not investigated their “Lung Function Test” and hence do not know about the status of their lungs. Whatever the case maybe, this winter should act as an eyopener for the authorities and a warning for the delpeting environmental conditions.